I have a love/hate relationship with plastic eggs…. But, I secretly love to find unique ways to use them. In fact, we created a plastic egg memory game and we even made glowing egg shakers. My kids loved those activities, but I was determined to figure out a way to use plastic eggs with art. 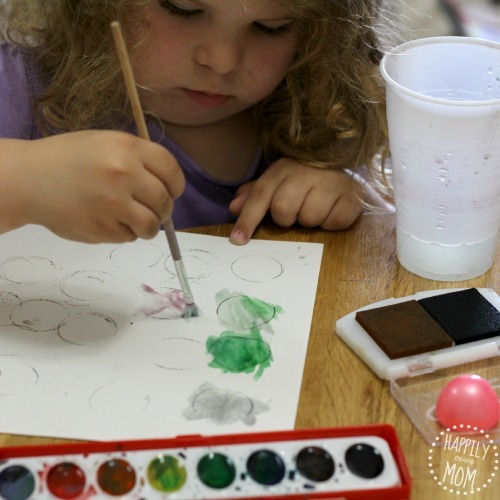 This is our idea for using plastic eggs as art for preschoolers! But, as she’s gotten older, she’s been more aware of the “right” way to paint or to craft. She’s very concerned with how her artwork looks. That’s why I wanted to focus on something that was entirely about the process. It’s unlikely that two of these paintings would look exactly the same and that’s awesome! 1.) 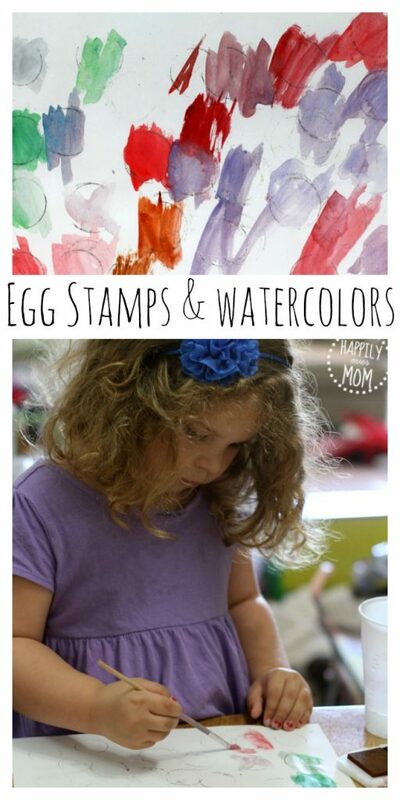 Grab your stamp pad and use plastic eggs as the stamp. You might have to help your preschooler get some good ink on the rim of the egg so that they can see the stamp. Let them make circles wherever they would like. 2.) Offer the watercolors. 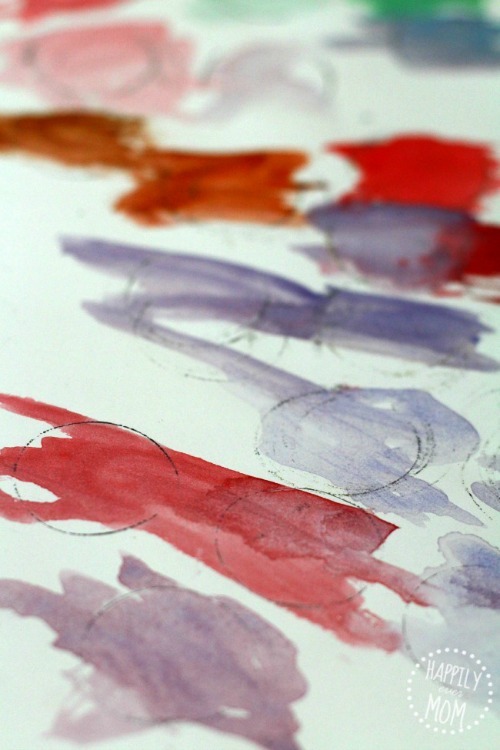 My preschooler tried to paint inside of the circles (like her own homemade coloring page! ), but let your child paint however they’d like! I had to chuckle when she said, “they just wash their hands!” but it struck me that this process had been so important for her. She wasn’t asking me if she was doing it the “right” way, she was proclaiming that she was a real artist. Now, that’s powerful! 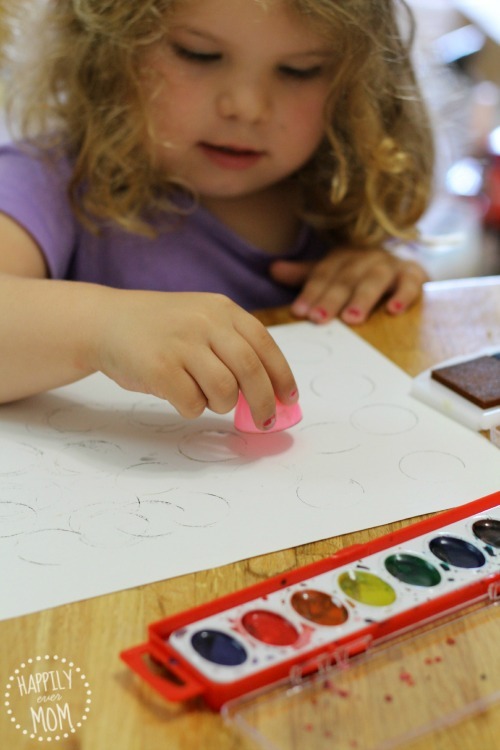 If you like this activity, come on over to our facebook page and share your favorite art for preschoolers!! Katie Joiner is a happy work-at-home Mom. When she's not busy saving her cats from the kids and trying to figure out what's for dinner, she can be found taking photos, laughing with her kids, and figuring out whether or not she can sneak in another Starbucks. Kids 7, 4, & baby <1. Come over and say hi at her FB page, @Happilyevermom, or , her favorite spot, Pinterest. Love the use of plastic eggs! A simple yet fun way to let L create art on her terms! 🙂 She’s definitely a real artist!